Because of its size, India is the home of a wide range of different environments-from high, snow-capped mountains to tropical rainforests and from hot and cold desert and scrubland ot lush, fertile plains and valleys. These environments provide a great variety of habitats for India's rich animal and plant life. Many zoologist estimate theat there are some 76,000 species of fauna (animals) in India. They included (1) mammals, (2)birds,(3)reptiles and amphibians, (4) fish, and (5) insects and other invertebrates (animals without backbones). Among the best-known of India's mammals are the Indian elephant and the tiger. 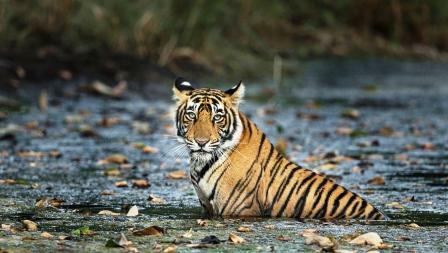 Tigers are india's largest cats. They live in the country's forests and grassy plains and swamps, especially the wooded foothills of the Himalayas. The other cats of India include four species of panthers- the common leopard; the all-black leopard; the rarely seen albino leopard; and the snow leopard, which are found only in the Himalayas. The Asiatic lion is now found only in the Gir Forest of Saurashtra, Gujarat.The one-horned rhinoceros is portected specied confined to eight wildlife sanctuaries, the largest of which is the Kaziranga in Assam, the home of 400 rhinoceroses. The commonest species of monkeys found in India are the rhesus monkey and the India are the Hanuman monkey, a type of langur.Another type of monkey, the lion-tailed macaque or wanderoo, is found in a small area of southern India. The gaur or Indian bison is a species of the wild buffalo. The nilgai, or blue bull, is found in most areas of the country.The markhor and Asiatic ibex, two types of goats, live in the Himalayas. India also has various kinds of wild antelope, bears,deer, gazelle, goats, pigs and sheep. The Karakul is a wild sheep of the northwestern India. Domesticated animals include cattle, sheep, goats, water buffaloes, camels, donkeys, mules, horses, and in the Himalayas, yaks. The Ganges dolphin is a fresh-water dolphin that lives in the Ganges, Brahmaputra, and Indus rivers. It may be up tp 3.6 metres in length. About 1,200 species of birds live in India. More than 85 per cent of these species of birds are residents within the country. The rest are migratory. Migrating birds reach India in September to November and fly back during March and April. India has more than 400 species of reptiles. The gharial, a long-snouted animal related to the crocodile, lives in the waters of the Ganges, the Brahmaputra, the Indus, and the Mahanadi. India has some 400 species of snakes, of which about 80 species are poisonous.